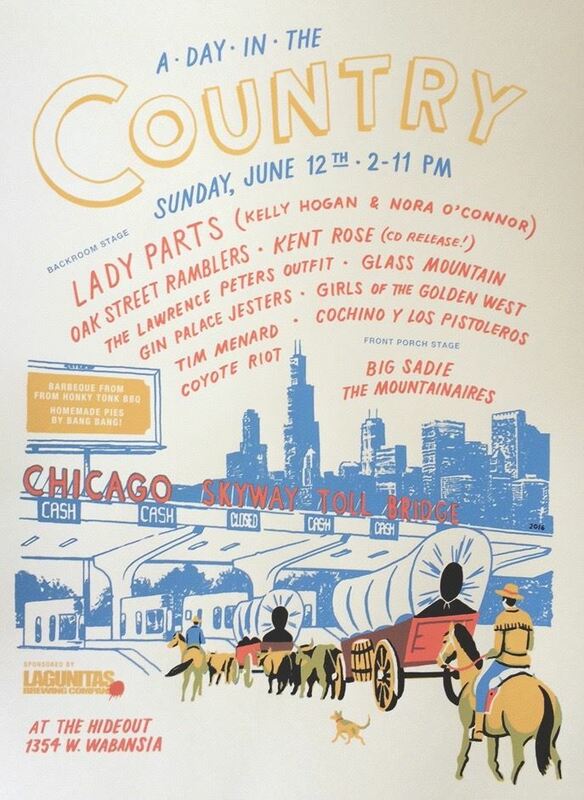 Looking forward to A Day in the Country this Sunday, June 12th at the Hideout! 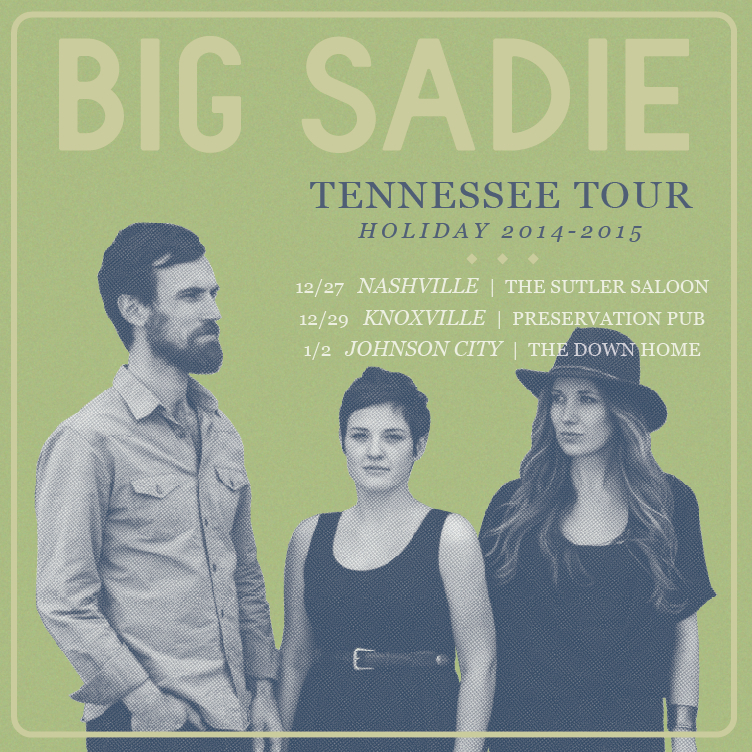 Big Sadie plays at 2:40pm. Elise and Collin will be joined by Andy Malloy on banjo and Dan Fuchs on dobro. You can also catch the foursome later that night at Big Star for Dust Up, a summer music and grilling series from our favorite taco and whiskey joint. Great day for music and eats in Chicago! It’s been a busy spring for Big Sadie, including a great sold out show last weekend at the American Legion Post in Evanston opening for Chris Jones and the Night Drivers. We have some exciting duo, trio, and full-band shows coming up later this spring and summer and hope to see some of you out there! Please visit our Shows page or see below for dates, details, and some additional updates. Jess has been hard at work on a handful of other projects. She spent the first part of the year on the road with Al Scorch. They’re heading out again soon for a good part of the summer, but we’re excited to have her home for a little while and back on stage with us for a couple dates in May. Jess and Al put on a thoughtful and energetic live show, so be sure to catch them if they’re playing near by (Chicago folks: Al’s record release show is on May 28th at The Hideout). Jess also recently released a lovely set of recordings of the songs she composed and co-wrote for the play “The Revel.” Take a listen here. We’ve been having a blast playing with Andy Malloy on banjo. He adds a nice dynamic to the group and will be joining us for several upcoming trio and full-band performances. Fiddler and frequent Big Sadie collaborator, Matt Brown, will also be making a few appearances. If you haven’t had the chance to see either of these lineups yet, we’re excited for you to hear these talented gentlemen play! We’ll be announcing additional dates soon, including a few Thursday evenings at The Charleston Bar in Chicago’s Bucktown neighborhood, so keep your eyes peeled for an update! The Edgewater Lounge is changing hands, so tonight will be the FINAL night of our weekly bluegrass residency in Andersonville (5600 N Ashland Ave). Join us tonight (Tuesday, May 5th) from 9pm-midnight for music and a festive farewell. We’re so thankful for all the great music we’ve been able to play and all the wonderful people we’ve met through these Tuesday nights and we hope to have something regular back on the calendar before too long. In the meantime, you can catch us around Chicago throughout the spring and summer. Very excited for next week’s show with our longtime friends Red Tail Ring. We’re playing at Uncommon Ground on Devon on Thursday, February 12th at 8pm. Last time Red Tail Ring came to town, their UC show sold out early, so be sure to call ahead and reserve a seat! 773-465-9801. Big Sadie is taking a couple weeks off from The Edgewater Lounge, but we have some friends filling in for us while we’re away…so you can still get your Tuesday night bluegrass fill! Elise and Collin will be back at the Edgewater on February 10th and the full band will return to our regular Tuesday schedule on February 17th. Music is from 9pm-midnight. 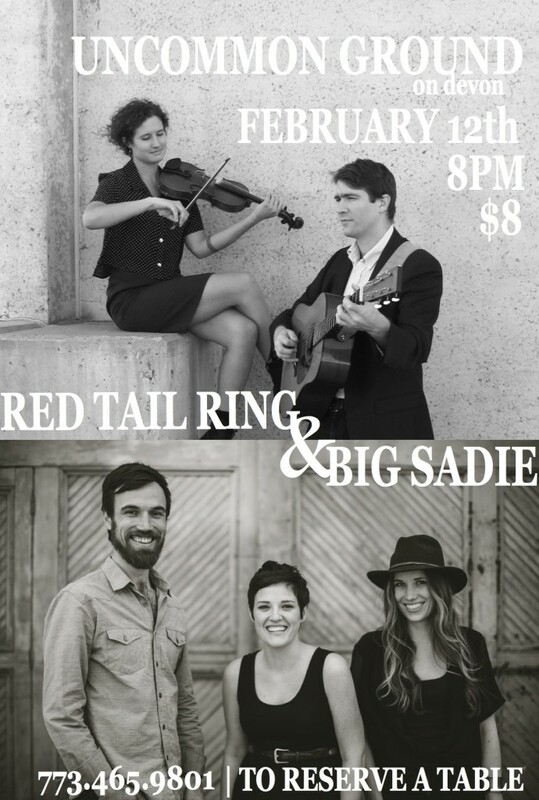 You can also catch Big Sadie this Tuesday, the 27th from 7:30-9:30pm at CH Distillery for the Spirit of du Sable Launch Party and Thursday, February 12th at Uncommon Ground on Devon with Red Tail Ring. Our last minute video submission to NPR Music‘s ‪Tiny Desk Contest‬! “Asheville” was filmed in a yurt in front of a very tiny makeshift desk on the last day of our recent trip to Tennessee. Enjoy! 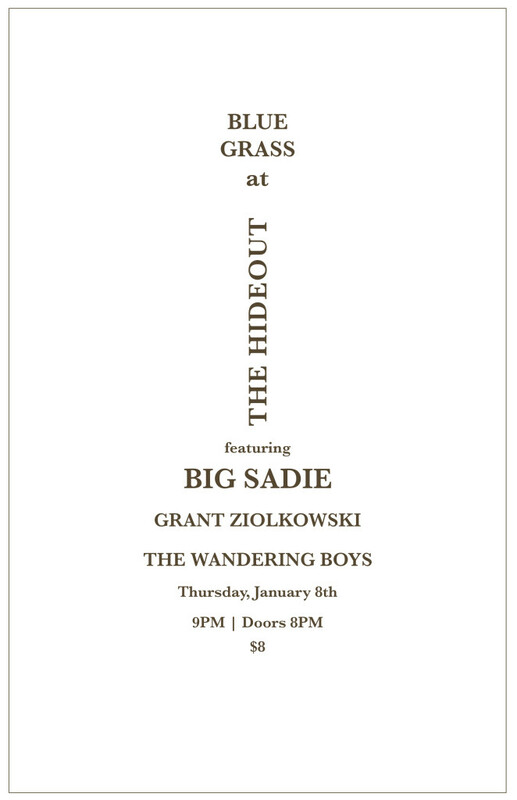 Looking forward to a great night of bluegrass this Thursday, January 8th at The Hideout with our friends Grant Ziolkowski and The Wandering Boys. This is one of our favorite spots in Chicago and we’re thrilled to be sharing the evening with such a talented line-up of pickers. Should be an awesome show. Come on out! Excited to announce a few shows in Tennessee over the holidays! We’ll also be stopping by WDVX to play on the Blue Plate Special at 12pm EST on Monday, 12/29. Those of you not in Tennessee can listen live at wdvx.com. See you on the road! 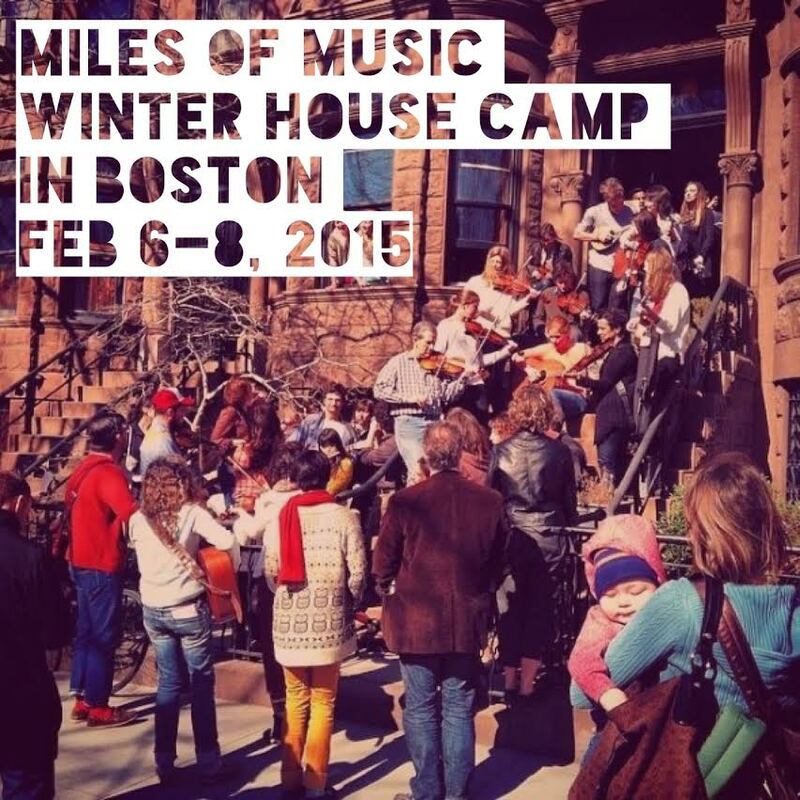 Miles of Music‘s Winter House Camp in Boston Feb 6-8, 2015! Want to play music with our very own Jess McIntosh and a handful of other stellar musicians? Jess is teaching at this 2-day workshop exploring traditional celtic and old-time music, modern songwriting, and how they work together. 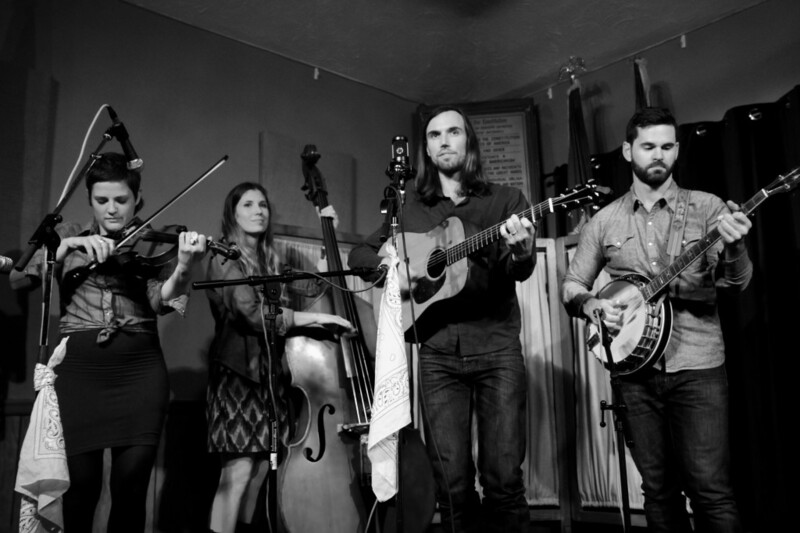 Come learn fiddle, banjo, guitar, mandolin, singing (lead and harmony), and songwriting. Additional instrument classes may be added based on camper interest. Work-study discounts available. A clip from our performance earlier this year at the Old Town School of Folk Music opening for Marty Stuart and His Fabulous Superlatives.